It seems as though the number of homeless people asking for help are increasing. Some people continue on their way while others try to help. Johnny Servantez usually kept walking until the day he saw Johnny Rhoades. Rhoades was in Indianapolis outside of the flea market and he needed help. 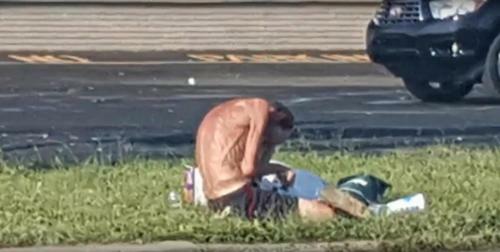 Servantez took a second look because the man appeared different than a classic panhandler. Rhodes was so emaciated his stomach appeared to touch his back. Servantez went against his rules and gave the man some money. He then took a picture so he could post it online. He listed the location and asked anyone nearby to stop and help him. This picture began making the rounds on social media until it was seen by the last person anyone would expect, the homeless man’s brother. Danny Rhodes admitted the picture made him sick to his stomach. He could not handle the fact that anyone could look this bad or be living this kind of a life. He had not seen his brother in years because they lost contact once their mother had died. The moment Danny saw his brother he knew he had to help him. The problem was Johnny was no longer there, he had moved on.